We've focussed this week on a number of timber and engineered wood product stories of relevance to local readers. In primary and secondary wood processing, the latest WoodTECH News ( www.woodtech.events) has just been released. It includes the very latest updates on breaking news, tech developments, research results, reports, case studies and links relevant to sawmilling, wood manufacturing and wood products companies throughout Australasia. Further afield, in North America, a recent report out on the sawmilling industry says that record high lumber prices are currently being achieved. It’s the perfect storm over there with some “incredible earnings” being achieved by some of the larger listed companies on both sides of the border. Projections are that this may not let up for another couple of years. In engineered wood products, the first delivery of cross laminated timber columns, beams and floor panels have just arrived at the Brisbane Showgrounds for what’s set to be the world’s largest and tallest (almost 45 metres tall) engineered timber office building. It’s going to be using around 5,000m3 of CLT. The plan is to have six storeys above ground by mid-2018 with completion expected in late 2018. 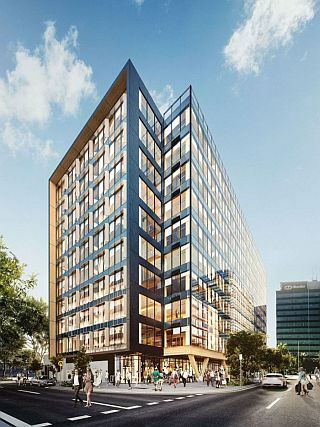 This will be Lendlease’s fifth engineered timber building in Australia and joins International House Sydney, Forte Apartments and Library at The Dock in Melbourne, and Jordan Springs Community Hub in Western Sydney. In Australia, Hyne Timber have also just launched their own cheeky campaign - “not your usual love story”. It's aimed at inspiring product specifiers to rekindle their passion with Glue Laminated Timber (GLT). We’ve supplied a link to the very clever brochure which forms an integral part of the new campaign. In New Zealand, the very early pioneers of manufacturing GLT, TimberLab Solutions, are celebrating their 60th year in business. Over this time, they’ve built up an international reputation working alongside clients around the world who've been specifying and building with locally produced GLT. It’s a remarkable story and we’ve included a short video clip documenting the company and its history. Finally, to celebrate training and business successes over the year, remember the regional Wood Councils across New Zealand are now in full swing. Planning for the huge gatherings of forestry companies and contractors anticipated to turn up is well underway. They’re easily the most well-attended gatherings of forestry companies and contractors in the regions. The awards evenings begin with the Southern North Island Wood Council awards on 11 May, Eastland Wood Council on 18 May, the Southern Wood Council on 25 May and Northland Wood Council on 6 July. For the first time in Australia this year, a regional training awards evening based on the recent success of Regional Wood Council’s across NZ will be running. It’s planned for the industry based around the Green Triangle region and will run in Mt Gambier on Friday 26 October 2018. Ensure you get along and support these regional awards programmes. The evenings are the one opportunity every year where we can celebrate and recognise the considerable training achievements and commitment to on the job training being made by those working within the industry. Enjoy this week’s read. The latest update for Australasia's sawmilling and wood manufacturing community, WoodTECH News ( www.woodtech.events) has just been published. It’s the third issue that has gone out. It provides the very latest updates on breaking news, tech developments, research results, reports, case studies and links relevant to sawmilling, wood manufacturing and wood products companies throughout Australasia. It’s been designed to complement the annual technology events being run by the Forest Industry Engineering Association (FIEA) in New Zealand and Australia. It also adds to the weekly updates being provided to forestry and wood products companies through the region’s two leading industry e-newsletters, Friday Offcuts and WoodWeek. It was suggested by industry at recent WoodTECH events that something needed to be urgently done to improve communication and networking for all those working on and in wood processing in the region. This need became even more apparent when the activities of the two saw-doctors associations petered out over recent years. We’ve had a great response since we’ve launched the new service at the end of last year. The concept of improving communication between companies and sites and incorporating both managerial and production staff along with some of the key suppliers has really struck a chord. News items continue to flood in and readership has already climbed to over 1000 working directly within the industry throughout this region. If not already on the list (it’s free), you can subscribe directly on the website. Finally, contributions, recommendations, leads and advice on what you’d like added to this site and new service is certainly welcomed. Hyne Timber has released its new Glue Laminated Timber (GLT) campaign - and it’s not what you'd expect from an Australian softwood processor. Playing on the love story Hyne Timber has with Australian pine, and with a focus on building relationships at every stage of the design and construction journey, the new campaign features plenty of cheeky puns and innuendo. It's part of Hyne Timber's service-based marketing strategy which sees the company working closely with both the specification and construction supply chains. Hyne Timber Marketing Manager, Jeremy Mead, said: "We're really happy with this playful approach and hope it will inspire product specifiers to rekindle their passion with GLT. "The aim is to find the fun angle in a time when complex issues like non-compliance, increased regulation and ambitious sustainability goals are becoming key motivators in our industry. It's a crucial step in driving engagement and interest in very complex topics. "It complements our T3 Green Plus video campaign in its effort to differentiate Hyne Timber, while motivating the building trades to get more familiar with the products they're using. It's a theory we’ve borrowed from the edutainment industry and has seen us develop unbelievably strong engagement and interest." In a recent article by Russ Taylor, Managing Director of FEA Canada, he outlined how the recent run on lumber prices has put big smiles on the faces of North American sawmill operators and lumber traders. Mill prices for all lumber species in North America have been trending higher since preliminary U.S. import duties began in February 2017, and especially after permanent duties (averaging 20.2%) started in late December. While the implementation of U.S. import duties on Canadian lumber was expected to push prices up somewhat, the interaction of several factors — the seasonal impact of summer forest fires in 2017, severe winter weather followed by railcar shortages in 2018, and continued strong demand in export markets — has created an almost perfect storm. As a result, record-high lumber prices have been achieved for most species before deducting import duties on U.S. shipments. In addition, record prices have been seen in such other markets as Japan: W-SPF J-grade reached US$660/Mbf (C&F Japan) in April and green hemlock squares have just cracked the US$1,000 mark. One of the major exceptions, however, has been in studs: U.S. prices have languished in comparison to dimension lumber. Are we in the “supercycle” we first predicted some 11 years ago? Maybe/probably. Certainly, the reduction in lumber output in the BC Interior and Eastern Canada has turned out as projected. The wild card has been the level of demand and (particularly) U.S. housing starts: these have recovered much more slowly than almost everyone expected but are now at a level that reveals the supply gap. This is why European lumber exports to the U.S. grew by 140% in 2017 and are up 125% through the first two months of 2018: Europeans (and Russians), attracted by high U.S. lumber prices, are providing the incremental volumes that Canada and U.S. sawmills cannot supply. As a result, sawmills are achieving incredible earnings, with some (West Fraser, Canfor, Weyerhaeuser, Resolute) seeing 20+% EBITDA (earnings before interest, tax and depreciation) on Canadian and U.S. sawmill operations in Q4/17. This should translate into windfall earnings in 2018 and 2019, and one issue facing some larger firms will be what to do with the cash generated. Some will likely increase capital expenditures, some will be considering acquisitions, and some will need to resort to buying back their shares. The thing all will need to remember is that their entire supply chain (from loggers through to customers) needs to be properly managed and maintained if strong operating results are to be achieved. Source: FEA Holdings – Canada Inc.
A key focus for this year’s WoodFlow 2018 event running in June is log measurement, scaling and tracking. Tasmania’s largest private forestry management company, Forico, has for a couple of years now been evaluating log measurement systems best suited to their operations. As well as managing 100,000 ha of timber plantations the company also operates two woodchip mills in NE Tasmania at Bell Bay and NW Tasmania at Hampshire. Over the last 12 months, the viability of installing a 3D laser measurement system to get the solid volume of bulk hardwood logs has been top of their mind. In addition to cost and operational improvements, the company’s aim has been to shift from log measurement in green metric tonnes to cubic metres to enable log drying across the estate to improve freight outcomes for woodchip and the log transport task. Forico have opted for a 3D laser measurement system which has been supplied by a Chilean technology development company, Woodtech Measurement Systems. It has already been installed and is being used by mills in Europe, the US and in Latin America. In addition to highly precise measurements (more than one million measurements per vehicle load) the measurement system reduces operational costs. Fewer operators are involved, quicker measurements can be taken and truck turn-around time is able to be reduced. Measurements are also taken on moving trucks. With 100% of the loads being measured, no sampling or conversion factors are required. The system was commissioned by Forico in late March and trials are still underway at the company’s NW operation. It’s the first time the Logmeter system has been deployed at a mill in Australia, New Zealand or South East Asia. Darren Herd, Strategic Resource and Logistics Manager with Forico will be outlining the company’s investigations into suitable log load measurement systems and results from their recent trials. Woodtech, the Chilean supplier of the laser measurement systems will also be involved in the WoodFlow 2018 June series. In addition to log measurement systems, an array of new international and local technologies and innovative operating practices around vehicle fleet operations, planning and safety as they apply to the wood transport businesses are being covered in this two-yearly tech update. Companies at the forefront of these innovations like Scania from Hong Kong, the LOTS Group based in Sweden, Chile’s Forestal Mininco, JRP Solutions from Canada and NZ’s Zero Emission Vehicles will be presenting as part of the series. Local forestry companies also play a major part in this event with Forestry Corporation NSW, Forico, Nelson Forests, HQPlantations and OneFortyOne Plantations all sharing their experiences. Woodflow 2018 runs on 20-21 June 2018 in Melbourne, Australia and again on 26-27 June 2018, Rotorua, New Zealand. It’s run every two years for Australasia’s forestry managers, harvesting and wood haulage contractors and transport planners. In addition to the two days of tech updates, conference delegates also this year have the opportunity of registering for two pre-conference workshops, one on cloud-based operations management and the other on transport planning. Both are free to Woodflow 2018 conference delegates and will run on the afternoon before the conference in Melbourne and in Rotorua. Innovatek's 3rd annual "Changing Perceptions" Conference is focused on the growing use of engineered timber in construction. It is scheduled for August 28th, 2018 in Rotorua, New Zealand. This conference will showcase the use of engineered timber internationally as well as exploring changes in timber use in New Zealand. The value of wood will be explored from different angles, including both emotive and economic responses to engineered timber buildings. The target audience is developers, architects, engineers, building designers, specifiers and quantity surveyors. The conference, that draws strong audience numbers, will continue on from the previous two events in this series, exploring further the use of engineered timber in buildings both in New Zealand and around the globe. This year’s conference has been timed to suit developers as the NZ Property Council is meeting in Rotorua the same week. We are working closely with a wide range of international operators, service suppliers, researchers and government organisations to develop a strong and innovative programme. If you are an early adopter, developer, innovator, technology supplier, service provider or researcher within the engineered timber and construction sector, the CPETC team would like to hear from you. If you are interested in being considered as a presenter, or would like to recommend an early adopter, case study or international expert, please contact us by visiting https://connexevents.com/cpetc2018/. The first delivery of cross laminated timber (CLT) columns, beams and floor panels have arrived at Brisbane Showgrounds for what’s set to be the world’s largest and tallest engineered timber office building, 25 King. At a height of almost 45 metres, the ground plus nine-storey Bates Smart-designed tower includes services provided by global engineering and infrastructure advisory firm Aurecon as well as three bespoke retail tenancies. Owned by Impact Investment Group the innovative building will also be the future home of Aurecon, with the company committing to lease four of the nine office floors. General Manager for Lendlease Building, Tony Orazio said construction of 25 King was well underway with the installation of the first pre-assembled modules taking place. “As the world’s largest and tallest engineered timber office building, 25 King will be one of the most exciting additions ever made to Brisbane’s skyline. A world first in sustainable architecture, 25 King is targeting a 6-star Green Star Design and As Built rating which will use 67 per cent less electricity and 55 per cent less potable water2 and is targeting a WELL Core and Shell rating. 25 King will see six storeys above ground by mid-2018 and is due for completion in late 2018, with Lendlease developing and building the asset. Lendlease will continue to work with its partners to lease the approximately 7,900 square metres of remaining office space. 25 King is Lendlease’s fifth engineered timber building in Australia and joins International House Sydney, Forte Apartments and Library at The Dock in Melbourne, and Jordan Springs Community Hub in Western Sydney. Lendlease is a partner in The Future Timber Hub, Australia’s leading timber research collaboration committed to challenging the barrier of timber construction by pursuing research-based strategies and innovation technologies to boost the timber industry. -	The project team has allowed two days to pre-assemble the modules in each floor cycle. Inspired by impressive facial hair and a passion for running, a group of forest managers are channelling the film classic Forrest Gump as they prepare to run 42 kilometres in the Rotorua Marathon. Paul Burridge, Ross Langley, Cam Eyre, Richard Cook and Josh Johnson have been training for the marathon for months and will be running to raise money for the Mental Health Foundation. “Most of us work in forestry, and some of us have beards. 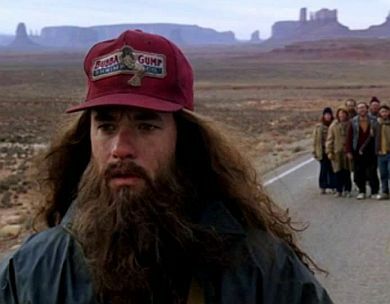 It made us think of Forrest Gump and his running efforts, and then the name, Run Forestry Run, just stuck,” Paul says. 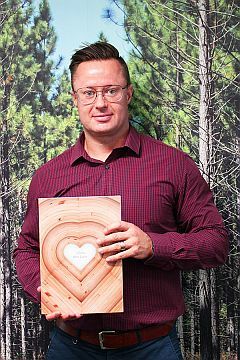 Paul, who is the Head of Export and Regional Operations at Summit Forests NZ Ltd, says the modern work environment can take a toll on people’s mental health and the group wants to draw the industry’s attention to the importance of supporting mental health and wellbeing in the workplace. But he says the Forest Industry Safety Council has recognised the role they play in supporting the mental health of forestry workers and is looking to add wellbeing into their programmes. “At the start of every year we have industry Safe Start breakfast events in various regions, which have a strong focus on health and safety, wellbeing and resilience,” Paul says. National industry leaders and representatives, including the Forest Owners Association, are supporting their marathon attempt, which the team hopes will help promote awareness for their cause. Companies and organisations including Forest Management NZ Ltd, Pacific Basin, John Turkington Ltd, PF Olsen Ltd, ISO Ltd, NZ Forestry Ltd, RMS FGI New Zealand, The Forest Owners Association, China Forestry Group NZ and Summit Forests New Zealand Ltd have already donated over $1000 each to the efforts of the team. “Some within the team have personally experienced struggles over the years with mental health issues, burnout in work and personal life, or have seen close friends go through the same thing,” Ross says. “Regular exercise and working towards a goal has made a difference in their lives”. “We train together as much as possible, even though the sessions can be a bit ad hoc,” Cam says. There have also been a few injuries and sometimes the snooze buttons have been too difficult to resist. Despite missing the odd run and some challenging training sessions, the time together and shared experience drew the friends closer and boosted their wellbeing. “A cause like mental health has really kept me grounded,” Ross says. “It’s given me new goals and challenges, and it’s a much better way of socialising, rather than catching up with mates over a beer.” Their advice to anyone who is thinking about running the Rotorua Marathon and fundraising for a cause is to “get amongst it”. “It’s great positive energy in the build-up and on the day the events are amazing. In the modern world, it’s easy to deviate away from team type activities but experiencing a challenge like a marathon as a team is truly revitalising,” Richard says. 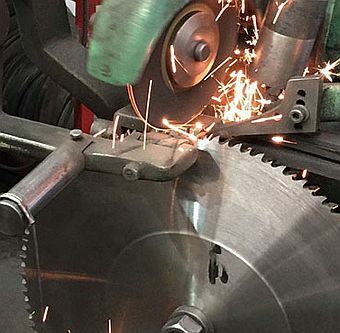 Udo Jahn, GM of Modern Engineering, Canada who spoke at last year’s WoodTECH 2018 event in both Australia and New Zealand has added another blog – this time an entertaining and informative look at just what sawmillers should be looking for when selecting and purchasing saw-guides. You wouldn’t BELIEVE what happened to me the other day. I’m still shaking my head. A customer called me up saying, “Udo, I just talked to a potential vendor who tried to sell me on their saw guides. He swore that they were state-of-the-art saw guides, the best in the industry—what do you think?” PLEASE. If you know me, I’m sure you can imagine my response. While I love a good rant, this really blows my mind. But there was something about this conversation that struck me. It reminded me of a story (more like a cautionary tale) one of our salesmen told me years ago—a story that is both funny and not so funny. 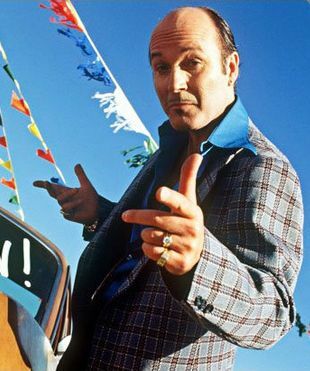 So, this salesman—let’s call him Bill (see photo)—was out pounding the pavement and managed to get an appointment with the head saw filer/ QC person at a rural sawmill. Bill is an enthusiastic guy, to say the least. He sat down and do you know what he said? I’m still cringing. He said, “We make the best saw guides in the industry!” The crickets are still ringing in his ears. The saw filer just stared at him with a disgruntled look on his face before shooting back, “Yeah, you and the last hundred a**holes who walked through my door.” Now that’s what my customer should have said to that salesman! When I heard this story, I roared with laughter. What reaction did he expect? We’ve all had salespeople walk through our doors and launch into a well-rehearsed speech proclaiming how amazing their products are. Have you ever bought into it? Yeah, me too. I’m still kicking myself. So when I say these products are sub-par at best, I know what I’m talking about. And let me tell you another thing—when it comes to saw guides, I know how to spot a doozie. More >>. This month TimberLab Solutions celebrates its 60th year in the production of Glulam and engineered timber solutions in New Zealand. Emerging from a long and successful history as the most experienced manufacturers in NZ, McIntosh Timber Laminates has completed its rebranding and has emerged with new colours and new capabilities into TimberLab Solutions Ltd. Extending the boundaries for engineered timber solutions is an ongoing passion for TimberLab. From exclusively manufacturing Glulam in the early days, TimberLab is developing new technology and expertise to be able to offer solutions taking into account a full suite of engineered timber possibilities. As part of that strategy the company has announced the appointment of Sam Leslie to enhance their technical and sales capabilities. Many of you will know Sam as he comes from his previous experience as Engineering and Innovation Manager at Xlam. Now entering the world of Glulam, Fabricated LVL and other Engineered Timber Solutions, he will bring to TimberLab a wealth of timber experience and innovative skills. 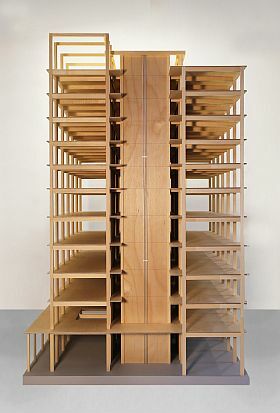 Sam’s passion is to see digital technology enhance engineered timber’s ability to achieve expanding horizons in providing detail designed, prefabricated construction packages. For further details tracing the 60 years of glulam production, check out the video below. New Zealand’s key forest industry associations are supporting penalties imposed in the District Court against Bay of Plenty forest owner Whitikau Holdings and two harvesting contractors. The companies pleaded guilty to charges laid under the Resource Management Act for damaging two stream beds near Opotiki in a logging operation which began in 2015. Whitikau Holdings was fined NZ$57,000 and the logging companies NZ$4,000 and NZ$3,000 respectively. “The New Zealand Farm Forestry Association is hopeful the penalties in this case, and the clear provisions of the National Environmental Standard for Plantation Forestry, will force such operators to change their approach and take a more responsible attitude when they are harvesting,” Neil Cullen says. The CEO of the Forest Industry Contractors Association, Prue Younger, says she is disappointed that some are putting the industry into disrepute. “With the recent introduction of Contractor Certification and the new National Environmental Standard coming into play, the industry is clearly standing behind best practice,” Prue Younger says. Peter Weir says the National Environmental Standard takes effect next week and it will raise the environment standard for all forest operations. “The NES represents the industry’s commitment to a set of legislative rules designed to reduce the effect of forestry earthworks, harvesting and other activities on the environment, including an effective reduction of planting for harvest on the most unstable terrain in New Zealand, now Red Zoned”. “Compliance with the NES won’t be a big stretch for larger companies with robust environmental systems, but it will require smaller players to set up to meet its requirements. The NES won’t stop the cowboy operators who, through carelessness, ruin streams, wetlands and our industry reputation. But it will mean that councils have a consistent rule-set and a clear mandate to protect the environment. Parts of the NES will become a template for other industries,” Peter Weir says. To gain real insight into today’s geospatial business landscape, ‘GIM International’ decided to ask some of the sector’s most influential companies for their opinions. This series of Q&As captures the current state of the industry from various perspectives, such as which technological and societal developments will have the most impact on the geomatics market, which market segments are the most promising and which areas offer the most substantial growth. The questions also explore the trend towards open data and open-source software. Here, Clint Brown from Esri shares his views. Cloud computing is enabling an instrumented world where computing can be harnessed to analyse and respond to virtually any issue. We envision that GIS will be recognised as a key enabling information technology for most big IT initiatives in the coming years – essentially integrating location intelligence into large to massive enterprise and cloud-based systems and hybrid systems. GIS provides a comprehensive approach for working with virtually all information sources. Further, the data in each individual organisational GIS is being brought together virtually to create a comprehensive GIS of the world in the cloud. Each of us are creating and maintaining our own layers, and because all GIS layers register onto the Earth, we are also contributing to and assembling a larger societal GIS for our planet – our individual GIS systems of record are being integrated, extended and deployed as systems for insight as well as communal systems for engagement. 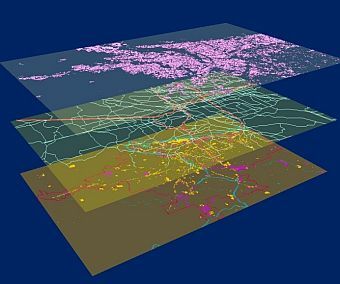 GIS has evolved into an essential information technology and will be at the centre of major advances in computing. Geospatial systems and expertise will be essential for our planet’s future. In the past decade, GIS has been expanding far beyond the professional GIS community. With the advent of apps, people everywhere began to use online maps – the foundation for shared GIS. Almost overnight, everyone began to recognise the power of GIS as an enabling information platform for improved understanding, decision-making, efficiency, communication and collaboration. GIS provides a geospatial framework to integrate and interpret results. Over the past few decades, the mass adoption of the internet has led to a glut of information that we have come to know as big data. GIS provides a geographic context to make sense of it all – while also providing the capability and the context to analyse that data in real time. The most interesting and exciting growth is in initiative-oriented and community-based systems. Communities are being formed around geographic locations as well as around common initiatives such as education, health care, environmental stewardship, smart cities, etc. Meanwhile, GIS is being applied in virtually every field of human endeavour, from helping businesses identify new customers to enabling our responses to natural disasters. The reach and influence of GIS is also expanding globally. GIS brings all digital content together and enables us to make interpretations to more deeply understand and to comprehend what is happening in a spatial context. For example, GIS maps help us to integrate IoT data feeds that will lead to deeper interpretation and understanding. GIS maps provide a framework for communication and understanding. Story maps have become a major revolution for GIS practitioners engaging with their communities. Over 400,000 story maps were shared publicly in 2017 across virtually every discipline, delivering critical messages and results in a very easy-to-understand way. 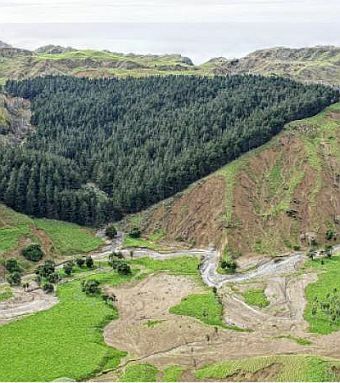 New Zealand’s Ministry for Primary Industries’ Erosion Control Funding Programme (ECFP) is providing NZ$830,000 to the Gisborne District Council to undertake high definition digital 3-D aerial mapping of its region to enable better informed erosion control and business decisions. 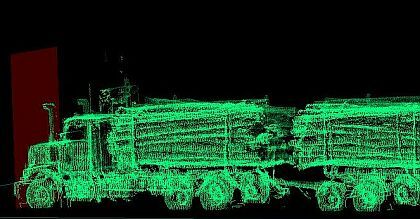 LiDAR is a remote sensing tool which uses laser pulses to generate large amounts of highly accurate geographical terrain data. “With LiDAR’s accuracy we’ll be able to use better data to accurately assess erosion risks, increase the effectiveness of erosion control treatments, and evaluate the success of past land treatments,” says Ben Dalton, Deputy Director General, Sector Partnerships and Programmes. “The East Coast is the most erosion prone region in New Zealand. The area has great potential for further primary sector economic growth but in many cases, erosion significantly affects pasture and other productive land. Leaving eroded land untreated has a negative economic impact on hill country farms, infrastructure, rivers, water quality, people and communities. “As a community we need to address erosion in the region now to ensure land remains sustainable for future generations. Addressing erosion control is a key component of succession planning,” says Mr Dalton. “There will be long term social, environmental and economic benefits for the community through the direct and indirect improved decision-making,” he said. The LiDAR data will be free for public and commercial businesses to use in a wide range of areas, including infrastructure design and investment, urban planning, and across the primary sector in agriculture, forestry and horticulture. Gisborne District Council Chief Executive Nedine Thatcher Swann says LiDAR is a key element in unlocking Maori land productivity and will be invaluable to the forestry industry which often fly localised LiDAR to help with harvest planting. “The data will also assist in road design and planning and enable us to better map and manage natural hazards, such as flood-prone, tsunami and storm surge areas. It will enable accurate mapping of active faults, landslides and earthflows and other areas of instability,” she said. The funding for the LiDAR initiative comes from the Erosion Control Funding Programme (ECFP) which supports the Government’s One Billion Trees initiative. With this funding community groups can lead projects that not only improve erosion, but generate wider environmental, economic and social benefits for the region. Examples of community initiatives could include increasing local seedling supplies, skills and labour, optimising land use for erodible land, new or alternative erosion treatments, riparian planting or post-harvest options. The Gisborne District Council and Land Information New Zealand (LINZ) will also contribute funding to the initiative. LINZ plays a key role in increasing LiDAR coverage across New Zealand, working with councils to collect the data and making it widely available. Timber Queensland is calling for the development of a new timber industry plan in partnership with the Queensland Government to help guide and deliver on the opportunities for industry expansion over the next decade. This is a particular focus of discussions at the timber industry’s 2nd biennial ‘Doing Timber Business in Queensland: Room to Grow’ conference that ran in Brisbane last week. “The opportunities for growth are quite significant and reflect the extent and diversity of the state’s timber industry, which can draw upon existing and future potential resources from softwood plantations, crown forest resources, indigenous forestry development, farm forestry and private native forest management,” Mr Stephens said. In 2012, the State Government and timber industry jointly developed a Forest and Timber Industry Plan. “This Plan has essentially run its course with many of the initiatives around market awareness and resource inventory completed. In 2018, its time for a renewed focus on resource development and manufacturing competitiveness, including through better resource security, energy savings, infrastructure, value adding initiatives and training capability,” Mr Stephens said. Labor’s 2017 timber industry election statement can be found here. The first containers to be used on a new direct shipping service between Whangarei, Brisbane and Singapore were delivered to Northport last Friday aboard a vessel named, appropriately, Northern Diplomat. The seasonal fortnightly shipping service is being offered to Northland businesses at the top of the North Island, New Zealand by Mediterranean Shipping Company (MSC), a global leader in sea cargo transportation and logistics, and will improve sea freight transit times for local importers and exporters. Customers already signed up to use the service include Northland growers of kiwifruit and other fruit, and exporters of manufactured timber products. The service will run for the remainder of the 2018 fruit export period but will be available for any kind of import or export container shipment. Northport’s commercial manager David Finchett said it represented opportunity for all industries across the region. He urged Northland business, both importers and exporters, to explore the opportunities presented by the new MSC service. “Our goal is to build cargo volumes to the point where the service becomes regular instead of seasonal. If we can demonstrate consistent demand for this shipping link from Northland importers and exporters there is no reason why it should not become a weekly service instead of a fortnightly one. 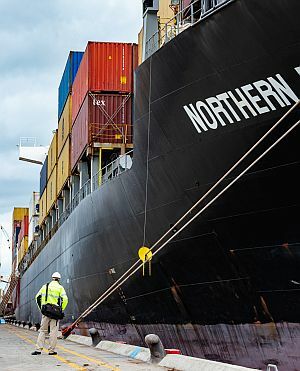 David Wilson, chief executive officer of Northland’s economic development agency Northland Inc, said new sea freight services linking the region directly with international markets presented significant opportunity for its economy. “Until now many Northland businesses have had to incur cost and time penalties to either bring things in through, or ship products out of, other ports. Links like this one, using our very own local port, bring new levels of competitive advantage to Northland and should be both welcomed and supported by local business owners. Mr Finchett said the new service fitted perfectly with Northport’s vision for growth. Listen to this call and follow the conversation to the end.